The city of San Francisco recently embarked on its inaugural Market Street Prototyping Festival (MSPF). The festival included three days of displaying interactive prototypes built by local designers, artists and residents that look to improve the city’s busy thoroughfare. Like Broadway in New York City or the Champs Elysees in Paris, Market Street is truly the heart of San Francisco. Yet at times, it can feel uninviting and disconnected. The concept for the festival stemmed from a desire to create a more vibrant and engaging destination, and evolved through a collaborative effort between the San Francisco Planning Department and Yerba Buena Center for the Arts. It was made possible through a $225,000 grant from the John S. and James L. Knight Foundation. The prototypes were selected based on their ability to respond to the community, inventiveness of the design, and the team’s ability to execute the proposed project, and were displayed throughout the various “districts” on Market Street. From the start, MSPF proved to be an event for the people, by the people. 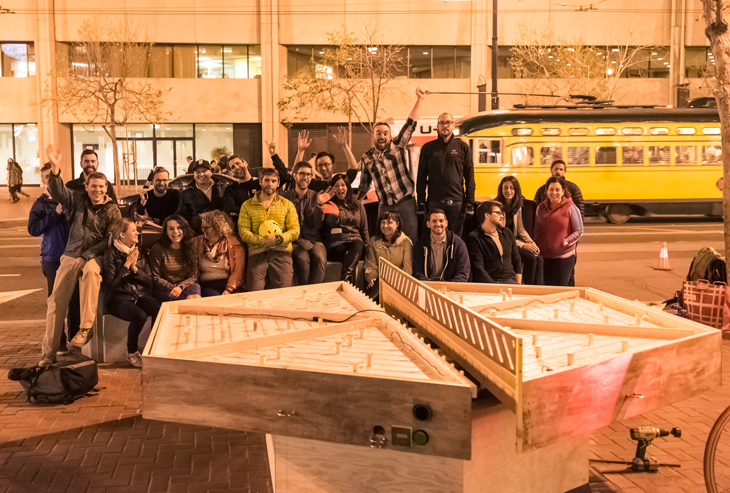 A collaborative effort between local talent, makers, and city officials, the prototypes proved that we can change the way we think about public spaces and consider new ways to adapt them for the future. The result was a model that many other national and international cities could benefit from for their own future projects of urban planning and design. Representatives from various companies including Autodesk, Dolby, and Twitter attended the kick-off event and participated in the festival. Gensler’s involvement was twofold. We designed an installation in the Retail Heart District, called “Exchange Portals,” which is centered on the ability to exchange perceptions, ideas, and meanings of various neighborhoods within San Francisco. Gensler also served as design captain of the same district, mentoring nine other artist teams and facilitating their installations. In addition to our role in the Retail Heart District, we created a second prototype, called Arena Play. More information on both prototypes can be found below. All-in-all it was a truly unique experience, and we are very proud to have been part of it. Working with Intersection for the Arts, artists collaborated with Gensler and Turner Construction to create a temporary installation comprised of six temporary gates (or portals) which displayed artwork that drew from the neighborhoods of San Francisco—their look, their feel, their senses and their communities. 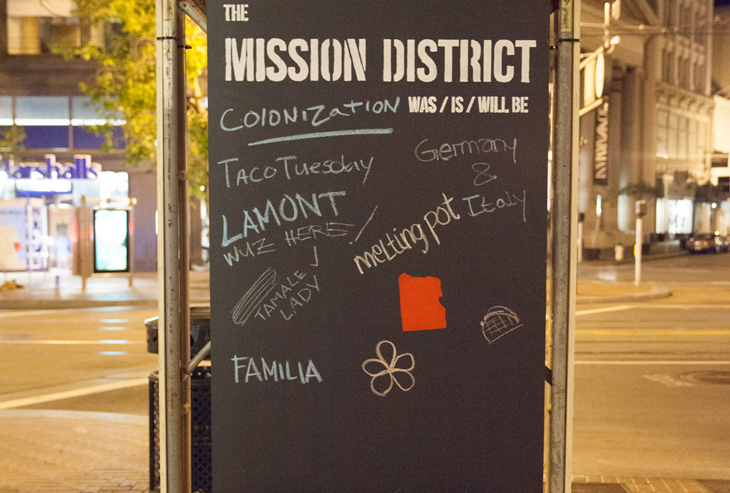 When passersby were piqued with curiosity, the Exchange Portals allowed them to leave their mark, so-to-speak, on each portal’s exterior chalkboard surface. Our second installment was a lively one. Arena Play was designed to provide an accessible, engaging experience with a level playing field (literally). Inspired by the diversity of Market Street and San Francisco, the team sought to create a game with an easy point of entry, one that was universally known, and suitable for a public setting. Enter Ping-Pong with a twist. The table was built as a hexagon, allowing for six simultaneous players to join. The “more the merrier” spirit resulted in interactions among strangers and friends alike. In true San Francisco fashion, the Ping-Pong table was tech-enabled with live Tweets, integrated LED lighting responsive to the ball, and an 80’s soundtrack cranked high, creating an energizing night-time experience. The team more than accomplished its mission to create a user experience that encouraged social interaction. The table was one of the most popular exhibitions throughout the weekend, and attracted an amazing variety of excited participants. As the designers, watching an idea transition from concept to results so quickly was very rewarding, and showed the true value of prototyping. Overall, one key learning from this successful event was that in order to improve a community, the community itself must lead the effort. They say it takes a village, and that rang true during this event. Exchange Portals from Eugene Lee on Vimeo. Kristi Loui is a designer in Gensler's San Francisco office. Her expertise is in conceptual master-planning forlarge-scale international projects in an urban setting. Contact her at kristi_loui@gensler.com. David Mayman is an environmental graphic designer in the San Francisco office. With a keen focus on digital and physical experiential design, David brings a holistic approach and a fresh eye to projects through his wide areas of expertise. Contact him at david_mayman@gensler.com. Your content creation is very unique and simply as awesome perspective. Extremely valuable read! Fabulous tips. Thanks for the taking time to write such an informative post.